Success Stories To Prove Why Employee Engagement Matters! Employee Engagement is a crucial subject all organizations should be considering. Employee Engagement is defined as the emotional and functional commitment an employee has towards their organization. This is driven by a mix of factors such as management, teamwork, and culture. These factors either encourage or deter the engagement of an organization’s employees. 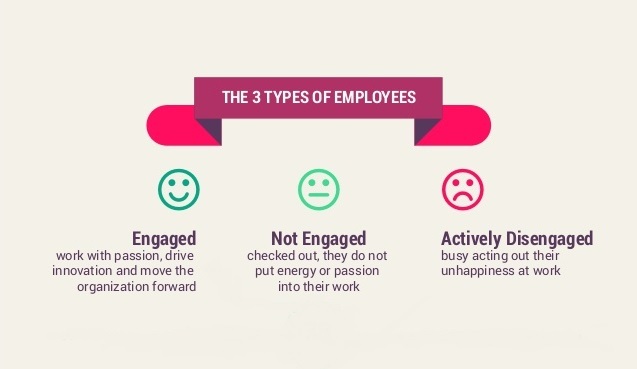 There are three types of employee engagement classifications that are widely used. These are engaged, not engaged, and actively disengaged. An engaged employee works with passion, drives innovation, and assists in moving the mission of their organization forward. Engaged employees often do more than what is asked of them. A not engaged employee has checked out. They lack passion and do not put energy into their work. They are often hoping or already seeking another employment opportunity. An actively disengaged employee, the least desirable to have in an organization, spends their work time acting out their distaste they have towards their organization. This could be by simply not doing what is asked of them or committing a harmful act against their organization. Not engaged and actively disengaged employees should both be considered as disengaged employees. A study by Gallup found from a generational standpoint, that employee engagement is getting worse as the age of the employee is younger, with the Millennial generation the least engaged. This is something that must be noted since two-thirds of the American workforce are Generation X or Millennial. 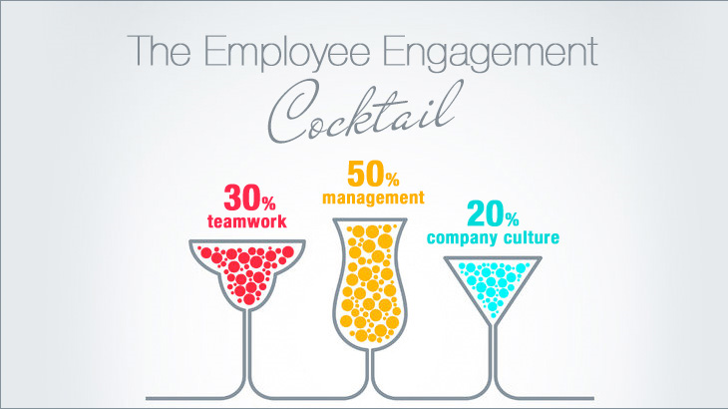 Gallup found on average only 33% of employees are engaged. The traditionalist generation is the most engaged at work at 42%. This is an issue because while they are the most engaged they are also the generation retiring the most. 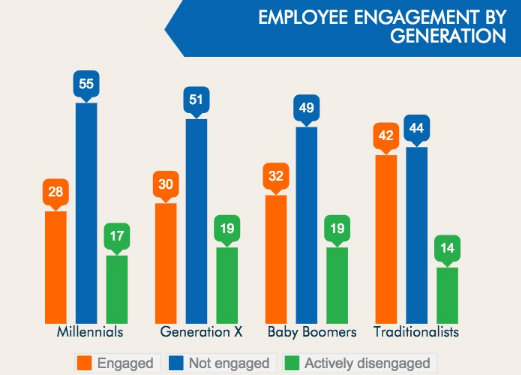 Unfortunately, those in my generation are the least engaged at work. With only 28% of Millennials engaged in the workplace. 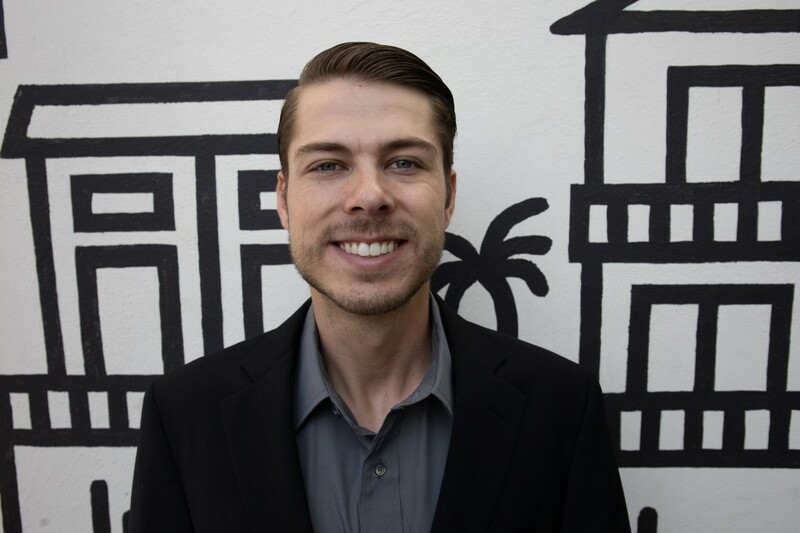 An example of a company that succeeds in having a predominantly young workforce with extremely high levels of engagement is In-N-Out Burger. In-N-Out has a strong company culture that spans more than seventy years. Glassdoor has ranked the burger company one of the top 15 places to work for four out of the last five years along with having one of the best CEOs the past three years. They focus on selecting leaders with a servant leadership style who strive in engaging employees in a positive and team-oriented way that drives them to provide quality service to customers. Their online and in-person training programs are another focus. Their employees have told them they feel more engaged when they are growing and learning concepts surrounding their job. 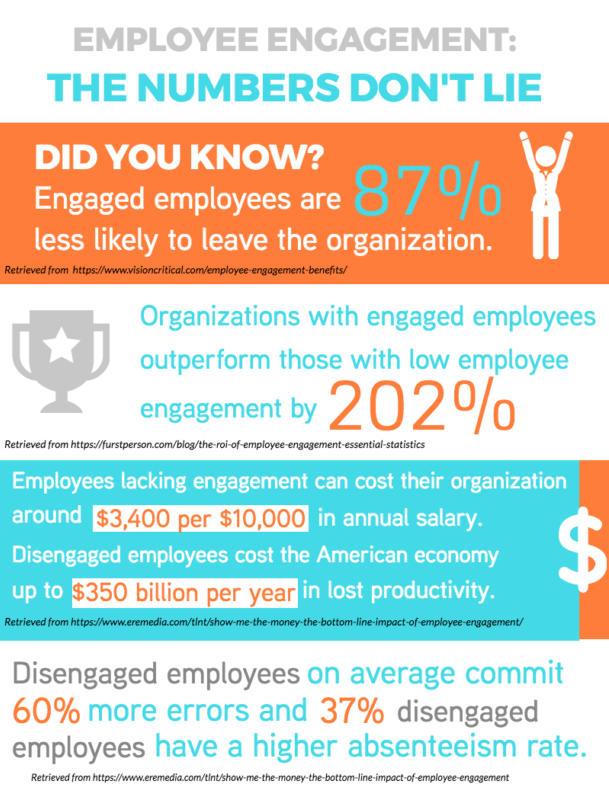 Engaged employees are 87% less likely to leave their organization. On the other hand, if your employees are not engaged issues can arise. Disengaged employees are outperformed by engaged employees by 202%. They cost their organization $3,400 for every $10,000 in annual salary which is an overall cost of $350 billion per year in lost productivity. This is largely due to disengaged employees on average committing 60% more errors and have a 37% higher absenteeism rate. Another organization that thrives at having high levels of engagement is Toyota. Toyota focuses on listening to their employees along with putting trust in their everyday hands-on experience with their role. They field employee suggestions at an astronomical rate. Over the past half century, they have fielded tens of millions of suggestions. In one particular year they received more than 700,000 suggestions. This was on average of more than ten suggestions per employee. Toyota implemented over 99% of these suggestions. To put the impact this engagement has on Toyota’s business into perspective, if each of these suggestions were to save or create value of ten dollars per suggestion, this would be an impressive total of $70,000,000. A survey of over 1000 employees from over a hundred organizations conducted by Cisco found what employees think would assist engagement and innovation. 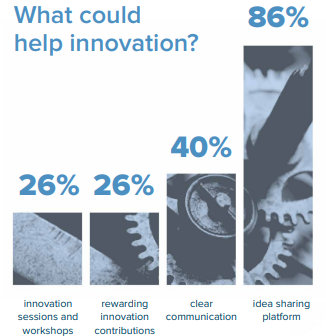 They found that 86% of employees think having an idea-sharing platform, such as DirectSuggest, could help innovation. 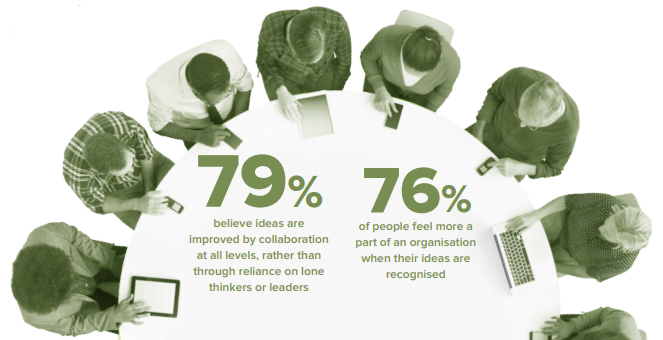 79% of employees believe that ideas are improved by collaboration at all levels. 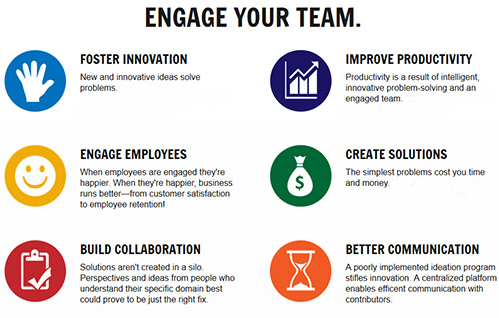 76% of employees feel more engaged with their organization when their ideas are recognized. Considering the contributing factors of employee engagement, this survey proves the importance of having a company culture that encourages teamwork along with having management that collaborates with employees and recognizes them. Possibly the most recent pivotal example of what can happen when a company puts a focus on engaging employees would be Amazon’s creation of Amazon Prime. At one time Amazon.com was known for selling books. Now most people know Amazon.com for their subscription-driven free two-day shipping, music streaming, video streaming, and much more called Amazon Prime. It is a membership many people cannot live without and has turned Amazon into one of the most valuable organizations in the world. This success would not be without an employee suggestion. Amazon Prime was first implemented in 2005. Amazon had implemented a virtual suggestion box for their employees . They encouraged employees to leave good suggestions. A software developer by the name of Charlie Ward left the suggestion that would eventually turn into what we know as Amazon Prime. 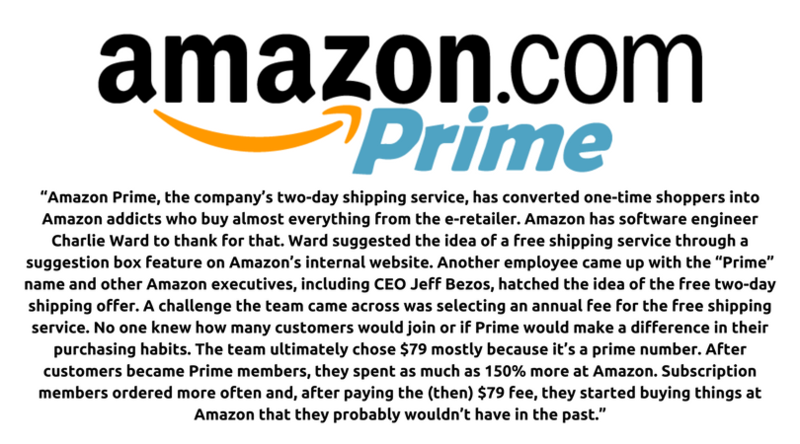 Ward came up with the idea for free shipping on product orders. After he came up with this idea CEO Jeff Bezos and other Amazon decision-makers concluded that a free two-day shipping service was the right idea. Once customers subscribed to Amazon Prime, the amount they spent on average increased by about 150%. Communication between employee and employer is something that must be a priority. Direct communications must be able to reach everyone. The channel of communication must be two-way, so employee and employer can communicate with one another. Mobile and computer-based platforms should be used to make it as easily accessible for everyone in the organization as possible. If your organization creates a strategy and culture that engages with employees through proper avenues, technological or not, it will spark employee engagement, foster innovation, improve productivity, solve organizational problems big and small, and establish better communication built on collaboration.